Wondering what to pack for Ireland? Need tips on planning your Ireland vacation? We've got the inside scoop on Ireland's weather, the Euro, safety & security while traveling, and lots more! Plus, check out our helpful videos in these sections: "What to Bring to Ireland" and "Electrical Items." Happy travels! Check out this short video about packing for your Irish vacation! The temperature in Ireland between May and September tends to be in the 60s -- sometimes a bit warmer (into the 70s) and sometimes a bit cooler (high 50s). Planning to wear layers is key to smart packing for Ireland. Also, Irish weather is quite changeable - it can be windy, sunny, and rainy all in one day! We recommend you bring a day bag (for example: small back pack or purse) and one suitcase - either a carry on size (22 in. high x 14 in. wide) or medium-sized (28 in. high x 17 in. wide). You can keep the day bag with you on the mini-coach (there's a nice overhead area above your seat) and your suitcase will go in the back of the mini-coach which you can access during the day if needed. You will need to carry your bags from the mini-coach into a guest house and possibly up a flight of steps. Many of these smaller local guest houses do not have elevators. 1 pair waterproof hiking shoes. You will be doing easy hikes in valleys and trails, which may be wet and/or muddy. Camera with battery charger. Please see the section "Electrical Items, WiFi, Mobile - Cell - Smart Phones" for additional information. Swimsuit - On the Go North tour, there is a manor home with an indoor pool. On the Go West tour, there is a hotel with outdoor hot tubs. And there's always the Atlantic Ocean beckoning you! Wash cloth. Irish bathrooms do not typically include wash clothes/face clothes. Electrical items such as cell phones, tablets, e-book readers, laptops, power cords, plug adapters, electrical transformers, etc. Please see the section "Electrical Items, WiFi, Mobile - Cell - Smart Phones" for additional information. Most of the accommodations have hair dryers but the Irish don't usually keep them in the bathroom. Look for the hair dryer in a dressing table drawer, bedside table, or a closet. The Irish tend to dress quite casually so you won't need any fancy clothes for dining out. There are opportunities to have laundry done on the free day of each tour. Self-serve laundromats are not common. You will drop off your clothes the night before or in the morning and then pick them up later in the day. To enter Ireland, you need a valid passport with an expiration date of at least 6 months after your return date. U.S. and Canadian citizens do not need a Visa to enter the Republic of Ireland or Northern Ireland (U.K.). If you are not a U.S. or Canadian citizen, here's a link that discusses Visa requirements for travel to Ireland. Breakfast at your guest house starts at 8 a.m. and the tour group will be hitting the road at 9 a.m.
During the day, you'll visit various sites, have free time for lunch, have spontaneous photo stops, and bathroom breaks are built into the tour route. People often ask "How much time is spent on the mini-bus?" With our style of tour, the routes have been designed to take you on some of the most scenic back roads of Ireland. So you may not get somewhere the fastest but you'll see the best of Ireland along the way. On a typical day, the amount of time on the mini-bus ranges from 2 - 4 hours broken up with lots of stops so most drives are only 45 minutes to 1 hour. You'll get into your overnight town between 5 - 6 p.m. Your guide will point out dining and pub options and you can choose where you'd like to eat that evening. With free time in the evening, you could go for a walk, watch the sun set, enjoy a pint of Guinness, and have a chat with the locals. To book an Inroads Ireland tour, please use our secure Reservations page. Step 1: You select your tour(s), how you heard about Inroads Ireland, and complete the booking form. Step 2: You review our Terms/Conditions and Waiver/Release forms. The next part is the payment section. We accept credit cards (Visa, MasterCard, Discover), PayPal, or check. Payment in full is due at the time of the booking. If you are concerned that your credit card may block the transaction due to a higher dollar amount, please notify them in advance of your plans to book a tour. Step 3: Your reservation is confirmed and an email is sent to the address provided in Step 1. In the confirmation email, you receive a copy of your booking, information about your Dublin starting hotel, how to get from the airport to the hotel, travel tips, and how to book additional nights at the Dublin hotel if you want to extend your Irish holiday. You're all set for your amazing Irish getaway! To stay up to date on Irish news, we'll stay in touch via our e-newsletter. One Month Before Your Tour Starts: You receive more detailed information about who is on your tour, your guide, the time to meet your guide and group on Tuesday morning, contact details for all your accommodations, and other travel tips. Take an overnight flight leaving on Sunday and arriving on Monday. Do not take a flight leaving Monday night and arriving Tuesday morning. You will miss the tour's departure on Tuesday morning. Flights arrive into the beautiful Terminal 2. If you are arriving from outside the USA or Canada, please be in Dublin by Monday evening to enjoy your night's accommodation. When you make a reservation, you'll receive an email with details about the starting hotel. The Dublin airport is located approximately 10 km or 6 miles north of the city center. You receive more detailed information about the starting hotel upon making a reservation. You have the option of taking a taxi or an express bus to the city center. Taxis: There is a taxi stand just outside the Arrivals Hall. The fare is generally 25 - 30 Euro to the city center. Taxis are available at all hours of the day. Express Bus: AirLink (7 Euro one way, 12 Euro return) provides quick, direct access to the city center. The AirLInk bus starts at 6 a.m. and runs every 15 minutes and drops off at the Christchurch stop on Lord Edward Street. It's then a short walk to the hotel. Please note: If you plan on doing a Hop On - Hop Off Dublin City tour, AirLink offers an Airport Combo Discount package. Your Inroads Ireland tour begins on Monday with checking in to your Dublin hotel. When you make a reservation, you'll receive an email with the hotel's details. We will work with the hotel to allow an early check-in. If that's not possible, you can leave your bags at the front desk and return in the afternoon to check-in. The rest of the day is yours to enjoy. Please see our Dublin Sight Seeing Tips section for fun ideas. If you took an overnight flight, take a short nap. For some people, this helps with jet lag. On that Monday night, try to go to bed at your "regular" time. Your return flight to the USA or Canada should depart on Tuesday. The tour ends late on Monday afternoon (around 5 p.m.) and your Monday night accommodation is included in the tour price. With most flights to the continental USA or Canada, you arrive home the same day. For U.S. bound passengers, we recommend that you arrive at Terminal 2 of the Dublin Airport 3 hours before your flight's scheduled departure. You will go through security and then U.S. Preclearance where you clear U.S. Immigration and Customs. Upon arriving into the U.S., your flight is treated as a domestic arrival. All you have to do is pick up your luggage and off you go! For Canada bound passengers, we recommend that you arrive at the Dublin airport 2 hours before your flight's scheduled departure. Airlines operating from Terminal 2 include Aer Lingus (international flights), Delta, United, American Airlines, US Airways, Emirates, and Etihad Airways. Aer Lingus (the national Irish carrier) flies directly from several U.S. and Canadian cities to Dublin. Other airlines (for example: United, American Airlines, Delta) fly direct depending on your departure city. Most major air carriers fly to Dublin (Airport code = DUB). When can you get the best deal on airfare to Dublin? That's a tough question to answer. Generally, if you start watching airfares 6 - 7 months before you plan on flying to Dublin, you can get a sense of where the price is. Websites like kayak.com let you create a "Price Alert" on a particular route and you are notified by email with price changes. TIP: Join the e-newsletter of the air carrier with direct flights to Dublin from your departure city and you'll get the inside scoop on airfare sales. The Euro (€) is the official currency of the Republic of Ireland. In Northern Ireland (U.K.), the British Sterling Pound (£) is the official currency. U.S. dollars are not accepted. If you're traveling on the Go North tour, you will be in Northern Ireland (United Kingdom) for 1.5 days in the beginning of the tour and on the tour's last day. British Pound Sterling (£) is the money currency in the U.K. You probably don’t need any physical cash as most places take credit cards. If you want £10 or £20 to have in your pocket for small purchases, there are ATMs available in Northern Ireland. Our recommendation is to use ATMs, credit cards, and avoid travelers checks. Banks have odd opening and closing times and smaller towns may not have the capability to exchange foreign currency. Some banks in Ireland don't cash travelers checks any more. ATMs are available in the Dublin airport and all across Ireland and accept Visa and MasterCard debit cards. If you have any questions about using your debit card abroad, please check with your bank. Also, it is a good idea to let your bank know when and where you're traveling to and to ask if there are foreign transaction charges. For credit and debit cards, Visa and MasterCard are commonly accepted. Discover and American Express are not widely accepted. ** For U.S. credit cards when doing a transaction in Ireland, you may be asked if you'd like the amount processed in US dollars or the local currency, Euros (Republic of Ireland) or British Pound Sterling (Northern Ireland). We recommend choosing the local currency so you will get the best exchange rate. If you choose US dollars, typically a 3.5% additional fee is added to your total. Should I take money (Euros) to Ireland with me? We recommend obtaining about €100 in cash (denominations of 20s or smaller) from your home bank prior to your arrival in Ireland. You can then take out more money from an ATM as needed during your trip. When traveling in Ireland, one strategy is to use cash for smaller purchases and your credit card elsewhere. Ireland has "Chip and Pin" technology for their credit cards. Irish people enter a PIN with all their credit card transactions. If you have a "Chip and Pin" credit card, you will be asked to enter your PIN with a transaction. American credit cards have "Chip and Signature" technology. Your credit card can be inserted into the slot for chip cards and a receipt will print out for you to sign. Ireland is somewhat of a non-tipping country. If you think someone did an excellent job and you want to tip, people would accept the tip with much gratitude. In pubs, the bartender does not expect a tip. Taxi drivers do not expect a tip. In nicer restaurants, you may see a "Service Charge" on the bill. This equals a tip. For your tour guide, tipping is optional. If you decide to tip, a suggested amount is €5 - 10 per day of the tour. A hearty and delicious traditional Irish breakfast is included in the tour price. To give you time to explore restaurants and towns, you have free time each day for lunches and dinners. This give you the flexibility to find the food you like and spend what you want. When you arrive in a town, your tour guide will provide recommendations for pubs and restaurants. Being an island nation, food in Ireland is more expensive than the USA, Canada, or elsewhere in Europe as much of the food is imported. A lunch of a sandwich, beverage, and chips can cost about €10. A sit-down dinner in the evening can cost €15 to €25. A pint of Guinness costs about €5. A glass of wine costs €6 to €9. On average, one may spend €20 to €40 per day on food and drinks depending on your tastes. Ireland can have a mix of sun, wind, and rain on any given day. Travel to Ireland is best between May and September. Temperatures tend to be in the 60s - some days may be warmer (low 70s) and some days cooler (high 50s). There is low humidity and few biting bugs :). The days are long with light, the countryside is beautiful and green, plants are blooming, and everything's open and accessible. Ireland's weather is influenced by the Gulf Stream and has a year-round temperate climate with warmer summers and cooler/damper winters. Ireland is in the Greenwich Mean Time Zone which is 5 hours ahead of U.S. Eastern Standard Time. The 24 hour clock is commonly used for air, bus, and railroad timetables. Ireland is a very connected country! WiFi is available in the majority of your accommodations and at bars, coffee shops, etc. Check with your current carrier to see if an International plan is available. Check if your phone can be unlocked and is compatible with different SIM cards. You can then buy a SIM card and a calling/data/text plan in Ireland. In the city center, you can go to Carphone Warehouse inside Currys PC World in the Jervis Shopping Center at 125 Abbey Street Upper. Want to buy a cheap mobile phone and minutes in Ireland? Carphone Warehouse inside Currys PC World in the Jervis Shopping Center at 125 Abbey Street Upper sells mobile phones, SIM cards, calling plans, and other accessories. Most of the accommodations on our tours have hair dryers but the Irish don't usually keep them in the bathroom. Look for the hair dryer in a dressing table drawer, bedside table, or a closet. How to Use Electrical Devices, Power Transformers, and Plug Adapters in Ireland and the U.K.
Q: What do you need to run a U.S. or Canadian electrical device in Ireland? A: There are two parts to the electrical equation: Voltage and the Electrical Plug Adapter. The first part - Voltage. Ireland and the U.K. has 240 volt currency and the U.S./Canada has 110 volt. Check the electrical device's power supply and see if it accepts voltage from 100 to 240. If YES, you do NOT need anything to convert the voltage. If NO, you need to buy an electrical transformer to convert the voltage. This can be purchased at most hardware or home stores. Please Note: Many computers, tablets, phone chargers, and camera battery chargers have power supplies that accept 100 - 240 volts so you would NOT need a transformer (also known as voltage converter). For example, this camera battery charger accepts 100 - 240 volts. 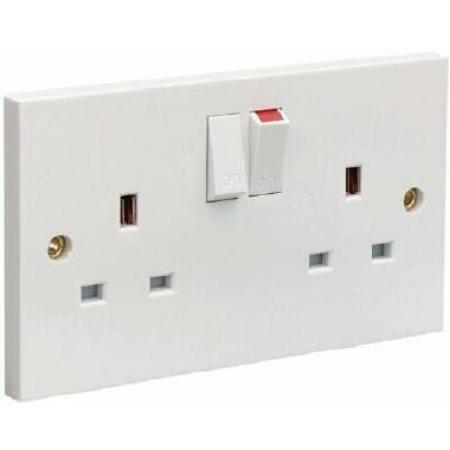 The Ireland and United Kingdom electrical plug has three large prongs. To plug in your device, you need an electrical plug adapter. The technical name is Type G. This can be purchased at a hardware or home store. Here's a picture of an Irish electrical outlet. Notice how there's an On/Off switch with each plug. When you see the red, that means On. Charging your cell phone and the power supply accepts 100 - 240, you only need the electrical plug adapter. Charging an item that needs the voltage transformer, you need the transformer and the plug adapter. Explore Dublin and the Surrounding Area! Trinity College, Museums, Tours...they all await you! Need to get acquainted with all there is to see and do in Dublin? A visit to Kilmainham Gaol (jail) is a fantastic way to learn about recent Irish history. Head over to the Guinness Storehouse at St. James Gate for a tour and possibly a pint at The Gravity Bar with uninterrupted panoramic views of Dublin. How about a Dublin "Hop On / Hop Off" bus tour? It's a great way to get oriented to the city and spend as little or as much time as you'd like at a place. Do a walking tour, a literary tour, or maybe a Georgian district tour. These can be done independently or with a group. Night Tours of Dublin offers Traditional Irish Storytelling, The Gravedigger Ghost Tour, Haunted History, Northside Ghost Walk, and Ride the Revolution. Pat Liddy's Walking Tours of Dublin includes Highlights & Hidden Corners, The Best of Dublin, Commemorating 1916, and Dublin Film Walks. How about a hike in the nearby Wicklow Mountains and Glendalough? Hilltop Treks will meet you in the city center and take you out for a day of fun hiking. A night of Irish dancing is available at the Arlington Hotel. The O'Connell Bridge location has traditional Irish dancing and the Temple Bar location has contemporary Irish dancing. A visit to historic Johnny Fox's in the Wicklow Mountains is sure to be a fun time! Famous for being the highest pub in Ireland, you're up in the mountains and just south of the Dublin city center. Johnny Fox's offers a Hooley Show (dinner, music, and Irish dancing) and there's even an Express Bus from Dublin to get you there! These companies offer day trips from Dublin to Newgrange, Glendalough, Kilkenny, Belfast, Giant's Causeway, a Mystery Tour, the Boyne Valley, and more! Dublin has numerous beautiful parks scattered through the city. On the north side of the River Liffey, walk up O'Connell Street, check out the Spire of Dublin, and the General Post Office (GPO) with remnants of the 1916 Easter Uprising. These tours are fairly easy going and involve easy walks to sites. You should have an average fitness level and good mobility. Bring a walking stick if you'd like. You are able to go on walks along uneven surfaces, up hills, and carry your bags to your room. To get to sites, walks can be 10 - 30 minutes and people take them at their own pace. And if you're just not feeling up to it that day, you can always opt out. If you have booked your Inroads Ireland tour and need to transfer your trip start date to a different tour, we are happy to do that as long as there is space available on a new tour date in the same calendar year. If you transfer your tour within 14 days of the original tour start date, you are responsible for accommodation cancellation fees. Transfers are allowed to tours within the same calendar year. If no space is available on another tour and you must cancel your trip, please see below. Exceptions to this policy cannot be made for any reason, including those of weather or personal emergencies. Single room supplements are considered part of the trip price and are subject to cancellation fees. On the rare occasion that Inroads Ireland must cancel a trip due to natural disaster, terrorism, or civil unrest, or any other circumstance, all payments received to date will be refunded. Inroads Ireland is not responsible for expenses incurred in preparation for any cancelled trips, such as airline tickets or for costs incurred due to travel delays, flight cancellations, or illness. Inroads Ireland tours takes no responsibility for delayed airlines and missing the tour's start, lost baggage, or any injuries that may occur while on tour. Participating in an Inroads Ireland tour is a perfect way to get a feel for Irish driving and the road systems. By doing a tour first, your eyes and brain have gotten used to being on the left side of the road and you'll be more comfortable with driving a car on your own. * In Ireland, you drive on the left side of the road and the driver's seat is on the right side. As our Tour Designer, Phil says, "Keep the driver in the center of the road and you'll be alright." * There’s an item called ‘Excess' and the car hire company will authorize 1500 - 2000 Euro onto a credit card in case the car comes back with damage. If you bring the car back without damage, the charge is removed. If you bring the car back with damage, they will deduct the repair cost from the authorized amount and refund the balance. * You can buy insurance to cover the Excess (around 15 - 30 Euro per day depending on the car) so if you bring the car back with damage, you owe nothing. * Using rental car insurance provided by your credit card doesn’t work in Ireland unless you have a U.S. issued World MasterCard or Canadian issued Gold/Platinum Visa/MasterCard. If you have one of those cards, the rental car agency would also want a letter from the credit card company confirming that you have the relevant coverage. * In Dublin, the M50 is the bypass motorway and when you cross the River Liffey in either direction, there’s an automatic eToll. You need to go online at eflow.ie by 8 p.m. the following day to pay the toll. * Manual transmission cars are very common to hire so double check on what you’re renting to see if it’s manual or automatic. Automatic cars will cost more. Also, there are extra costs for additional drivers. * The minimum age to hire a car is 21 and many will not rent to anyone over 75. If a company does rent to drivers over 75, you may be required to provide proof that you are in good health and have not been involved in any accidents in the past five years. * Pack lightly as trunks (or the ‘boot’ as the Irish say) are smaller in Ireland. Make photocopies of your passport, airline tickets, write down the account numbers of items in your wallet along with phone numbers to call if lost/stolen. Bring a copy of this information with you PLUS leave a copy of this information with a trusted person at home. Minimize financial risks by leaving expensive jewelry, watches, and electronics at home. If you are carrying a purse, sling it across your chest or hold it close to your side with the clasp towards you. If you are wearing a backpack, swing it around to the front if you are in a crowded area. Carry small amounts of money on you. Don't put a wallet with money in your back pocket. Split up your cash. Only carry what you need for that day. If you are carrying a purse, put some money in your front pocket. When walking about town, take only the items you need - some cash, a credit card/ATM card, photo ID, etc. If you are using an ATM after dark, go to a well lit ATM with pedestrian traffic. There are about 4.75 million people in the Republic of Ireland and about 1.8 million people in Northern Ireland (U.K.) making the total population of the isle approximately 6.55 million people. Dublin is the capital of the Republic of Ireland (commonly abbreviated ROI) and the most populous with approximately 1.2 million people. Dublin was originally a Viking settlement and was founded in approximately 800 A.D. The official Irish name for Dublin is Baile Átha Cliath, meaning "town of the hurdled ford". The English name for the city is derived from the Irish name 'Dubhlinn' meaning "black pool". Dublin is situated in the province of Leinster near the midpoint of Ireland's east coast, at the mouth of the River Liffey. Irish and English are the official languages of Ireland. In primary and secondary schools, children are taught both languages. 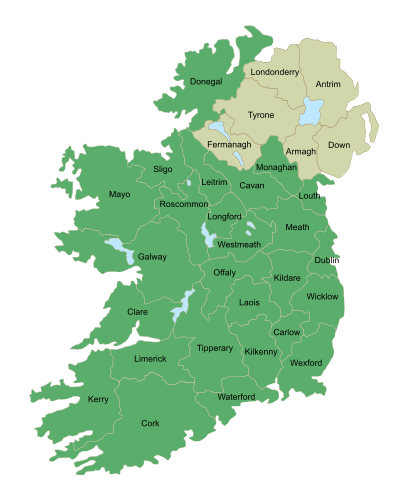 There are four provinces in the Republic of Ireland: Leinster (in the east), Ulster (in the north), Connacht (in the west), and Munster (in the south). There are 26 counties in the Republic of Ireland and 6 counties in Northern Ireland (United Kingdom). Ireland achieved independence from Great Britain in 1922 and ratified the Republic of Ireland constitution in 1937. Ireland's head of government is the Taoiseach and has a parliamentary system. Driving is on the left side of the road. The steering wheel is mounted on the right. A good tip to remember to stay left: Keep the driver in the center of the road and the passenger on the edge. Driving speeds are in kilometers per hour in the Republic and in miles per hour in Northern Ireland. Let us know…we’re here to help!